Last night at the Indiana State Fair, Sugarland was getting ready to take the stage and perform for a large crowd when the wind picked up the stage and then threw it down into the crowd, killing five people and injuring 40 others. Out thoughts and prayers are with the family of those lost and those still recovering. 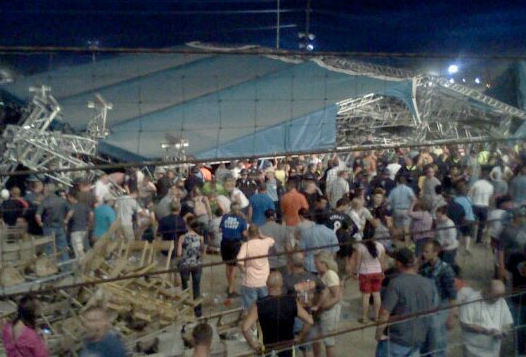 I smell a really big lawsuit coming… this could be the end of the Indiana State Fair. I am also feeling horrible for Sugarland. You know this has to be so hard for them. It was their fans there, in the front waiting to see THEM when they lost their lives. It’s such a horribel tragedy.